The last week of my winter break was spent in a cloud of plaster dust. No, we’re not putting an addition on our house; and no, my husband did not finally repair our bedroom ceiling. 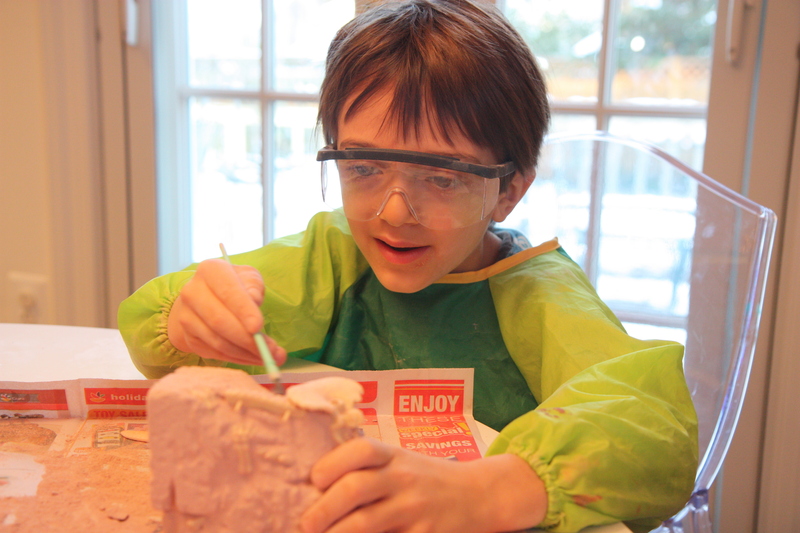 I’m referring to the Excavation Kits that my son received for Christmas, the kind that come with kid-sized tools for chipping away at blocks of pink plaster, in an attempt to unearth miniature replicas of prehistoric bones. We are talking about a six year old engaged in hours upon hours of independent, uninterrupted work. Are you hearing this, my fellow parents? You need to get Santa to come back. Right now. And you won’t even mind the mess—in fact, you’ll never be happier to clean plaster dust off the floor. There are kids so obsessed with dinosaurs that they not only know the names of them, but they can pronounce them correctly, tell you in which periods they lived, and rattle off lists of what they ate. JP is not one of those kids. He might be able to identify 15 dinosaurs, despite our reading extensively about them over the years (and I wouldn’t fare much better). For him, the lure lies in the process of dinosaur discovery, the means by which fossilized bones get from some remote dusty location to the pristine museum halls. I’ve mentioned before how much we love Jessie Hartland’s How the Dinosaur Got to the Museum (Ages 4-8), arguably one of the simplest and best introductions to the science of paleontology. And don’t even get me started on the downright fascinating portrayal of field work in Barnum’s Bones: How Barnum Brown Discovered the Most Famous Dinosaur in the World (Ages 5-10), by Tracey Fern and Boris Kulikov. But (and I do apologize for this) I’ve been holding out on telling you about another of our favorites: the Pièce de Résistance of Dinosaur Books. I’m talking about National Geographic’s The Dinosaur Museum: An Unforgettable, Interactive, Virtual Tour Through Dinosaur History (Ages 5-10). For the tactile learner, this book has it all: pop-ups, pull-outs, wheels, flaps, and tabs. If that sounds juvenile, I assure you it is not, for the hefty book is also packed with hard facts about dinosaurs, clearly arranged in categories like “The Meat Eaters,” “Gentle Giants,” and “Swimming Reptiles.” But the real draw here is the museum setting—specifically, something called the “Dinosaur Lab” inside the front cover, where you can cycle through microscope slides or pull out desk drawers in order to examine evidence behind the dinosaur exhibits on subsequent pages. As kids make their way through the book, they are often asked to refer back to the Dinosaur Lab for more information, for a close-up look at a skull or a thumb spike. It is as if the very format of the book is making the point that our knowledge of dinosaurs is only as good as the guesses of scientists, only as good as the fossils they find and the observations they make. OK, I lied. I said that the best part of JP excavating dinosaur bones (while the rest of us lounged around in our PJs) was that it gave my otherwise jittery six year old a prolonged focus. But, actually, we parents got some pretty high entertainment out of it. Peering over his safety goggles (his own idea), JP informed us: “I am the most famous dinosaur scientist in the world. You’re probably going to want to ask me some questions and take some pictures. With your real camera, not your phone.” And so, the next thing I knew, I was interviewing “Dr. James” and learning how he had spent the past 16 years living on a campsite in Virginia (“a nanny takes care of my children, but I allow them to come and help me from time to time”) and unearthing dinosaurs never before discovered. “See this? I’m working on the skull right now. I know it’s the skull.” And when he had finished assembling the complete skeleton, I was told that it was actually not a Triceratops as the box indicated but in fact a new species that Dr. James coined the Stegoplate. “When I get to be a little bit bigger, can I look for dinosaur bones, too?” my daughter piped in. Of course. And in the meantime, let’s make plans to go back to the Smithsonian Natural History Museum. It’s time we got another look at the actual Diplodocus Longus from How the Dinosaur Got to the Museum—and maybe pick up some more Excavation Kits while we’re there. I can get behind this kind of learning. The paleontologist at work (and yes, I took this with a real camera!). Hooray for engaged learning! What a delight to hear imagination, inquiry, and future planning from young learners. Did you buy those kits at Burpee Museum in Rockford, IL? You are currently reading Digging for Dinosaurs at What to Read to Your Kids.